The show that so quickly spawned a subculture continues to prove itself just another show. And that’s fine. It’s not redefining kids’ shows, it’s not deviating from established formulae and it’s not broaching surprisingly tough topics for a colourful show for smaller kids as many hoped at the start – but it is still enjoyable, easy viewing. There are a few signs of the malaise that affects so many shows towards the end of extended runs. One is that old cliché, a new main character. The ‘Mane 6’ still have their adventures and lessons to learn, but they’re starting to achieve their goals. Rainbow Dash is a Wonderbolts reservist, thus essentially has fulfilled her life’s goal. Twilight Sparkle is princess of friendship, wings and all. Rarity has her boutique, and the others are pretty well-established and content with their lots in life now. 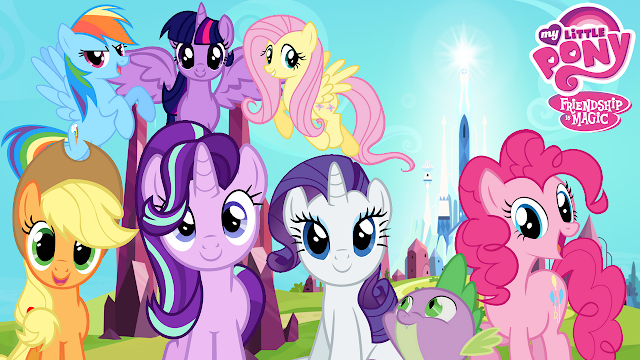 Even the Cutie Mark Crusaders have actually completed their mission and transcended the ‘blank flank’ subplot, which is the biggest flag for the show ending soon yet – though they continue to have little adventures helping others get cutie marks, which is just a little forced. But yes, a large part of the focus now turns to Starlight Glimmer, once an antagonist whose episode was actually a very interesting analogy for libertarianism, as she ran a village where individuality and rising above the rest was forbidden, so no pony could feel inadequate or ashamed – only for the heroes to prove, of course, that being unique and special in your own distinct way is extremely important. In this season, she is reformed, and Twilight takes her on as a student. The little pony taken under the wing of a princess now becomes a teacher in her own right, which is quite a nice progression but another end-of-character-arc flag. As for Sunset Glimmer herself, she’s really not a very interesting character. She’s given centre-stage in both the opening two-parter and the season closer and manages to just about be likeable without actually being interesting. Her angst about her past isn’t a good hook for her character and she just needs more personality quirks in a group that not only has had five seasons of development, but had most of their key moments in the first handful of episodes. It’s a little bizarre when a random juvenile from a previous season’s antagonist race is more interesting than your new major character – though Thorax’s story’s conclusion was a little too cheesy. Otherwise, the show plumbs the depths of classic derivative cartoon plots. Rainbow Dash makes dumb mistakes in her new position, or helps out other trainees who are in a pickle. Rarity’s new boutique has problems with its opening day and difficult staff members. Delicious home-cooking eventually wins over the hearts and minds of a society that mindlessly follows critics. It’s nothing original, though sometimes it’s very well-done – I rather enjoyed the Rashomon episode. In the end, I’m left feeling unmoved by this Pony season. It’s not exciting, new, fresh or different any more. If they had gone the Fawlty Towers route and ended this show in its prime, it would probably have endured, but this fading into mediocrity is painful – doubly so when the writers are so keenly aware of it they make an episode bitching about fans who only like the oldest instalments of a franchise. Really, they make a character – Quibble Pants – who has this as his defining characteristic…and then he sees the error of his ways not by being shown later instalments are just as high-quality as the rest, but only by finding out what he thinks is fiction is actually reality, with a tacked-on random speech later about how old and new episode have different focuses, thus different pros and cons. It was horribly transparent, insecure writing that really got on my nerves. Yet still I will watch on, until the end. But I’m not sure how much steam is left in this one. I have no idea what any of this means, but I still want to die.